Before I begin my tour of the museums here in DC, I want to take a minute to extend my utmost gratitude to a few people. First, the NCTE team in the DC office, Jenna Fournel and Lu Ann McNabb, for being gracious and welcoming. I will miss our little office camaraderie. Second, my family. I was only able to have this incredible experience only because of the support of my amazing mother-in-law, who came down to DC to watch the kids for three weeks, and my sweet parents, who flew out for grandparent duty for the remainder of the time. Finally, my darling husband, who has been alone at home with a screaming cat for over a month. My deepest thanks to you all. It’s tough to explain to a twelve-year-old the sheer power of words. Ironically, words don’t do themselves justice. 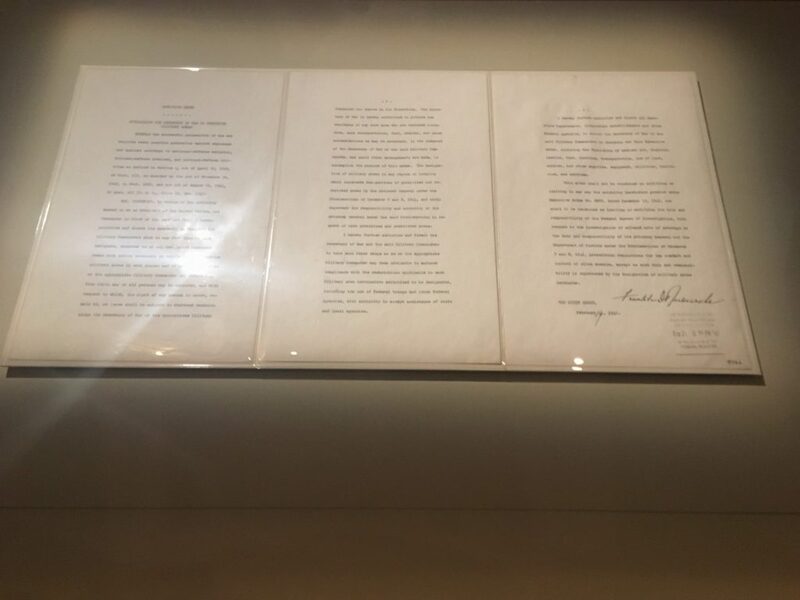 As I made my way around the sights in DC, I found myself constantly in awe of the words all around me and the way in which they have shaped, and continue to shape, our country. Below is a collection of my thoughts, lesson ideas, and reflections on five museums, in the order in which I viewed them. As a teacher of the Diary of a Young Girl, the Holocaust is a topic I discuss with eighth graders every year. The main exhibit experience begins with a large group of people packed into a steel elevator, that makes you instantly uncomfortable. When you exit, you are met with videos taken during concentration camp liberation, and a giant photograph of burnt corpses. The silence in the museum is overwhelming. Two areas in particular spoke to me. The first was the section on propaganda. This year I would like to have students analyze the rhetoric of Joseph Goebbels to answer a common question: Why were people angry at Jewish people? How did Goebbels use words to confuse and deceive? The second section I found interesting was about the League of German Girls. During our unit study, we cover Hitler Youth, but I didn’t know about its female counterpart. Finally, I have tried researching contemporary genocides in the past, but I would like to revisit that this year. The USHMM website has a rich library of educator resources, including a couple of interesting professional learning opportunities. I uncovered a few neat ideas here. Most important is Wonderplace, a super awesome play space complete with a climbing structure, and kitchen with fake fruit, and the Spark!Lab where kids can be inventors and make stuff. Kiddos were happy for hours. The exhibit Many Voices, One Nation made me think, How do the words of many people, across time, unite to form a country? I could have my students look at the works of the authors we study, Edgar Allen Poe, Richard Wright, Daniel Keyes, and whoever else gets tossed in there this year-to see how each of their unique voices became a part of the narrative of America. Executive Order 9066 got me thinking about how words can be used to strip people of their liberties. I’ve been a fan of these guys since I met them at NCTE’s Annual Convention in 2014. 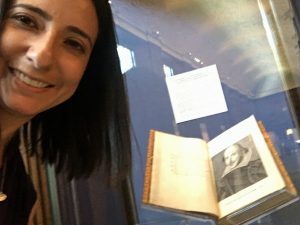 I’ve used their incredible resources for teaching Shakespeare, and they also offer professional learning opportunities, including a month-long stay here in DC to study Shakespeare in depth. Of course I had to visit! The current exhibit showcased paintings of Shakespeare, the man himself and the scenes from the plays. The library is home to the largest collection of Shakespeare works, as well as other rare Renaissance works. Since I took the tour, I got to peek in the reading room. Swoon. During the tour, our guide mentioned that Shakespeare was not wholly original and that he took many of his stories from other authors. How can words be refashioned into something new and exciting? 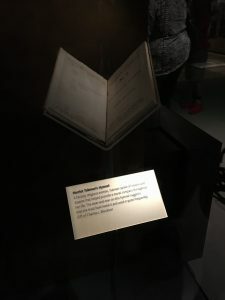 On an unrelated note, while at Folger I enjoyed learning about Project Dustbunny, dirt from the gutters of books analyzed for past readers’ DNA – wild. This museum is the newest, opening in September 2016. I noticed a few different ways in which words were important, especially for someone who teaches Richard Wright’s, Black Boy. 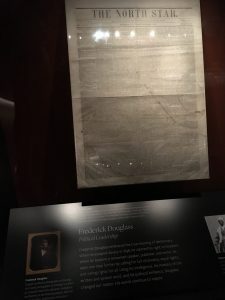 First, Nat Turner’s Bible and Harriet Tubman’s hymnal were on display. Both struck me, and I thought, How do people find strength and comfort in words during times of pain and turmoil? I look forward to examining this question with my students; it’s a topic that pairs nicely with Anne Frank finding solace in books. Finding comfort in words can be a common thread throughout history. The abolitionist paper, The North Star, was founded by Frederick Douglass. My kids will love seeing the actual paper. Alongside the reading of Black Boy, my students and I read the Narrative of the Life of Frederick Douglass, an American Slave. A question for my students will be, How can we use words to fight for change? This question will be especially useful as we follow Wright on his journey of discovering how authors used words to fight against racism. 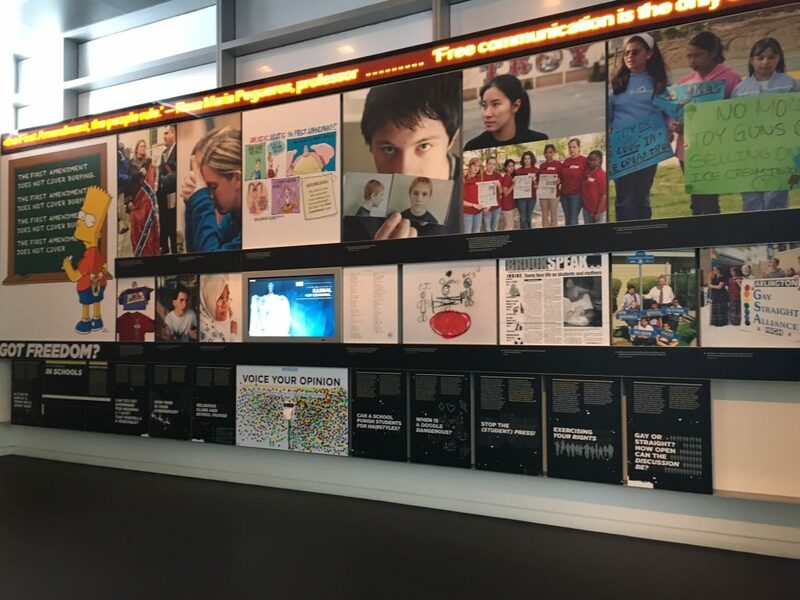 The Newseum “promotes, explains and defends free expression and the five freedoms of the First Amendment: religion, speech, press, assembly and petition.” Tons of great ideas here! Around the outside of the museum are front pages from each of the fifty states and around the world. What a great activity for teaching media literacy. I want to pull the day’s headlines from three papers and have students analyze the differences. How can we use the same words to paint a different picture? There was also a neat exhibit on each of the five freedoms. This might be interesting to explore as my students learn about the Bill of Rights in social studies. How are the words of the past relevant today? I want to explore the modern issues relating to each of the five freedoms. There was also a really cool display about the rights of students, which I know mine will enjoy talking about, especially the parts on dress code. A question I will ask is, How can you use words to fight for what you believe in? And now I, NCTE’s 2017 Kent B. Williamson Policy Fellow, am signing off. I hope you enjoyed following along as much as I enjoyed the journey. Please contact me, I’d love to connect and chat. Peace.